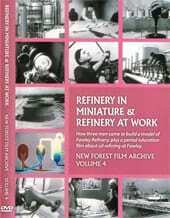 An educational film about the processes behind oil refining, shot partly at Esso’s Fawley Refinery. The chemistry is explained with the use of some quirky colour animations set in an otherwise black-and-white film. Listen out for the music by Benjamin Frankel and the voice of Maurice Denham. Spring clean is a tidy piece of work!